We aim for dramatic reduction in friction which accounts for a significant portion of energy losses in mechanical systems. 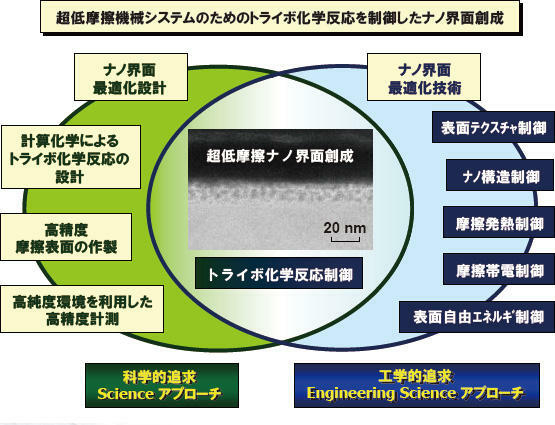 Theoretical design of low friction system has been recognized as too difficult because friction is complex phenomenon that is affected by numerous factors such as material properties and experimental conditions. In this project, we focus on “nanointerface” which is self-formed by friction-induced chemical reaction so called “tribo-chemical reaction”, and we clarify and control it from the viewpoints of material science, chemistry, physics as well as mechanical engineering. Based on such scientific and engineering understanding, we pursue creation of “nanointerface” which realizes super-low friction.